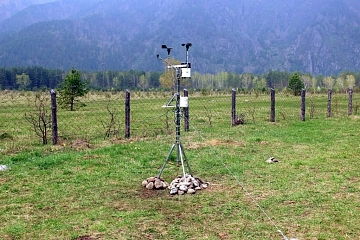 Altai State University has put new weather station into service at the beginning of May. It is located on the territory of university’s camping site in Chemal. The weather station is equipped with automatic sensors that will capture the following climatic variables: atmospheric pressure, solar intensity, free-air temperature, atmosphere relative humidity, amount of precipitation, and soil moisture. Installation and commissioning of the weather station was carried out by Vice Rector for Scientific and Innovative Development, Candidate of Geography Evgeniy S. Popov and Assistant Professor of the Department of Radio Physics and Theoretical Physics, Head of the Laboratory for Physical Problems of Agrosystem Monitoring, Candidate of Physical and Mathematical Sciences Vsevolod V. Scherbinin. “This automatic weather station with self-contained power supply is aimed at registration of main variables of atmosphere, precipitations and soil moisture. Our station has soil moisture sensor, anemorumbometer (wind indicator) that measures wind velocity and direction, solar pyranometer that measures solar radiation and intensity, precipitation gauge. Temperature sensing elements is installed in the shade under the solar battery. Atmospheric pressure sensor is located in the box, where multifunctional logger of temperature and humidity is installed. The station pole is grounded in case of atmospheric electricity hazard. This system has already started to capture the data,” noted Vsevolod V. Scherbinin. 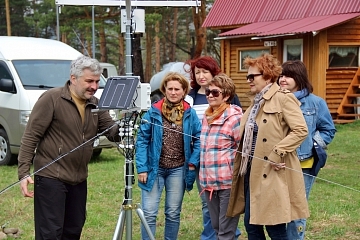 Similar weather stations had been installed on the territory of other camping sites of Altai State University. 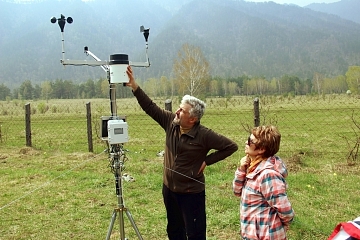 It is to be noted that the weather stations set up by Altai State University are actively used for educational purposes at the faculties of biology and geography. Work with modern measuring and analytical equipment allows students majoring in ecology and geography to acquire necessary practical skills for field work.